Josh Gwartney, principal of the early childhood center at Chouteau-Mazie Public Schools, displays the paddle available to be used on students. 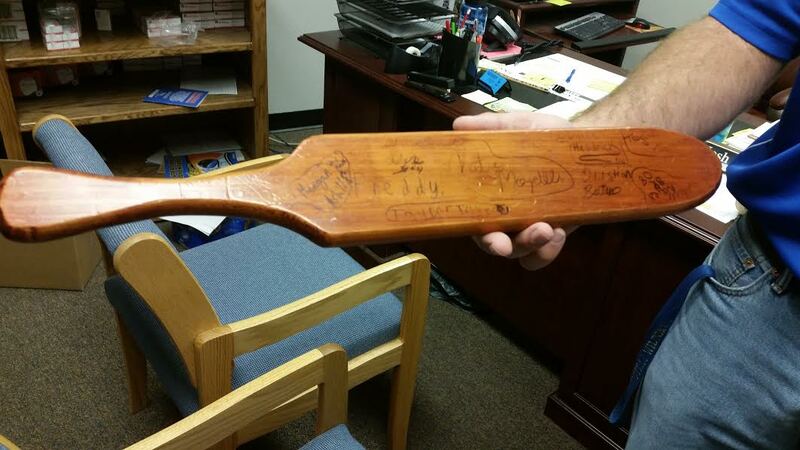 More than a dozen names are inked onto the wooden paddle tucked behind Principal Josh Gwartney’s desk. Each name memorializes a child who was given a swatting in Chouteau-Mazie Public Schools, located about 25 miles east of Tulsa. How many students were paddled at your school? Gwartney, who leads the early childhood center, said the paddle is rarely used on the center’s pre-kindergarten through second-grade students, and only with their parents’ permission. Paddling also is used in the district’s elementary, middle and high schools. Superintendent Roger Mason said the biggest benefit of enforcing that discipline is that students know the paddle exists, and will likely try to stay out of trouble to avoid being swatted. Oklahoma is one of 19 states that allow schools to physically discipline students. It has the fourth highest rate of corporal punishment of both all students and special education students, who have learning and emotional disabilities, according to discipline data for the 2011-2012 school year collected by the U.S. Department of Education. In that year, special education students made up 15 percent of Oklahoma enrollment but were more than 20 percent of students who were physically punished. At dozens of schools, special-needs students received corporal punishment – generally paddling – at much higher rates than their peers. A total of 2,199 special education students, and 10,802 other students, were given corporal punishment in Oklahoma in 2011-2012. Proponents of the practice say it is needed to ensure order in the classroom. Opponents say paddling has no long-term benefit and can traumatize students, especially special-needs children, who have conditions such as hyperactive attention deficit disorder or learning disabilities. Oklahoma City Attorney George McCaffrey, who often represents parents of special-needs children, said the higher rates of physical punishment of special education students indicates schools are lashing out in frustration instead of addressing the disabilities underlying the behavior. Not all Oklahoma schools use corporal punishment. Generally, those that do are in smaller, non-urban districts. Of Oklahoma’s 1,774 schools, 587 used physical discipline in 2011-2012. The discipline data for each public school are reported by districts to the U.S. Department of Education. The department said the data is verified through a process that includes computerized checks and certification by a district official. At Chouteau-Mazie High School, more than three-fourths of its special education students, or 38 in total, were given corporal punishment, the data show. None of the other students were paddled. Mason said that administrators from that school year are no longer at the district, so no one could comment on the disparity. He also questioned the accuracy of the federal data, but said he had no way to substantiate his doubts. Mason said he does not believe the district over-disciplines special-needs students. Mason was referring to protections under the Americans with Disabilities Act and the Individuals with Disabilities Education Act. Special education advocates and attorneys say districts can get around those protections by claiming the student’s behavior is not related to his or her disability. That places the burden of proof on the parents. Mason said Chouteau-Mazie gets permission from parents of children in all grades before using corporal punishment. The parents can also be present for the paddling. Another school that reported a large disparity was Rattan Elementary School in southeast Oklahoma. The federal data show 19 special education students, or 36 percent, were physically disciplined, compared with none of the other students. Rattan Public Schools Superintendent Shari Pillow said she doubts the federal data for the district’s schools are accurate. She said she didn’t have the district’s 2011-2012 report to the federal government. She also did not respond to requests for more recent discipline data for her district. The Rattan district uses a wooden paddle, and students are paddled for serious offenses such as fighting or hurting another classmate, Pillow said. Pillow said she doesn’t believe special education students are targeted for corporal punishment in Oklahoma or nationally. Traci Cook, executive director of the National Alliance of Mental Illness for Oklahoma, said that instead of punishing special education students, districts should focus on what’s causing a student to misbehave. In most cases, a student’s behavior is tied to his or her disability, meaning paddling, suspending or expelling the student will do little to fix the problem over the long term. Many of the state’s largest districts, including Oklahoma City Public Schools and Tulsa Public Schools, have banned corporal punishment. Legislation has been introduced over the years to either limit the practice or expand it by giving teachers more authority to decide whether to use corporal punishment. None of the legislation passed. In Lawton Public Schools, teachers and administrators are prohibited from using corporal punishment. Superintendent Tom Deighan said one reason is a fear that the district will be sued if a child is hurt. Another is a belief that paddling ultimately doesn’t improve a child’s behavior, he said. “You can follow the law, you can do it exactly as the law prescribes, and it still puts the staff member and student at risk,” Deighan said. One lawsuit that arose from physical punishment was a case involving a developmentrally disabled child at Deer Creek Public Schools in Edmond. In 2008, the parents of the boy sued the district alleging their son’s federal rights were violated when school employees slapped him on two different occasions, held him down on a desk, and placed him frequently in a timeout room. The child “was known to occasionally yell, throw, kick, hit, spit, throw tantrums and otherwise exhibit disruptive behavior,” court records say. When asked about corporal punishment, State schools Superintendent Joy Hofmeister did not state her position on the issue, but said any allegations of child abuse need to be reported.